So, July 27th saw me complete my third century ride ever, and my second within literally less than a month. My first brush with riding a century came during the Fall of 2011. When I had started riding my bike again, I decided a worthy goal to train for was completing a century by the end of the year. It turns out the Evanston Cycling Club hosts an annual ride called, 'The North Shore Century.' It is approximately 100 miles (ends up being slightly longer), and winds from Evanston, Illinois to Kenosha, Wisconsin and back. The route is fairly scenic and for those with more modest mileage appetites there are numerous shorter options. That first year, I started late, it was cold and rainy, and as a result the best I could manage was 75 miles. However, that 75 miles was about 35 miles farther than I'd ever ridden in one day before then. I vowed to break through the 100 mile barrier the following year. So, 2012 arrived and with relative ease I was able to ride the 100 miles. My total time in the saddle, as I recall was something on the order of seven-something hours. I rode with a buddy and we tended to spend a bit too much time at the rest stops, not to mention we blew about 20 minutes earlier in the day waiting for a fellow rider who had bailed out without telling us. Also, we stopped to help several other riders beset with mechanical difficulties on the side of the road. This all increased the amount of time we spent over the course of day to complete the ride. At the end of the day, I completed the ride, lessons were learned, and I decided I could ride more centuries in the future. So, 2013 rolled around and a co-worker happened to be riding a century that was going to wind its way from Chicago to Milwaukee, one way. Fortunately, this co-worker's wife was willing to play shuttle driver and so arranged to pick us up in Milwaukee following the end of the ride. I wanted to photograph and blog about that particular ride, but seeing as it was only my second century, I didn't want to be weighed down with the extra weight of my camera or the need to document the ride and constantly be having to hustle to catch up with the group. The only photos I ended up shooting from that ride were a couple shots of Lake Michigan shot from a parking lot at the Racine Zoo, in Racine, Wisconsin. Fast forward to July 27th of this year and I was prepared to ride my third century ever, and my second within less than a month. The route for the 'Pampered Century' was to be very similar to the North Shore Century. 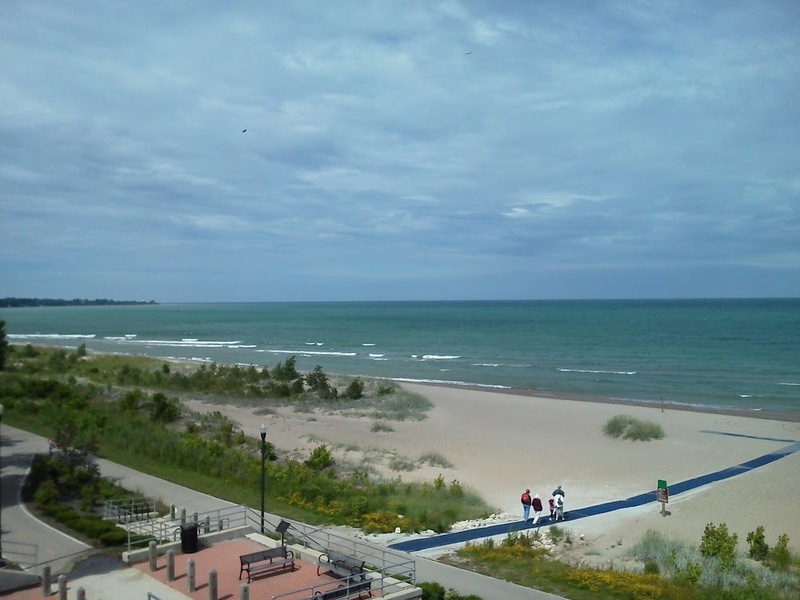 The route was a basic loop from Evanston to Kenosha and back. A joint venture between the Chicago Cycling Club and the Evanston Bicycle Club. The Pampered Century was to be what I would call an average pace ride with an average speed of 15 to 19 miles per hour. Some folks will ride a century at a much more leisurely pace while others attempt what is called a Sub-5 century, in other words, riding 100 miles in less than five hours. I think with three century rides under my belt I can safely say that around 15-17 mph is a comfortable pace for me where I don't end up feeling too tapped out at the end of the ride. Still, the pace sounded good, and having ridden the North Shore Century twice, I was confident that the route would be picturesque and mostly on streets and bike paths with low traffic volumes. The turnout for the ride was around twenty people or so. Light mechanical and sag support was to be provided for the inexpensive sum of $20. Riders were provided with cue sheets and at each rest stop, the gentleman who laid out the route would offer advice on specific things to look out for during the next leg of the journey as well as the occasional historical points of interest along the way. The mid-point of the ride was to be in Kenosha, Wisconsin at the Washington Park Velodrome. The ride began a little after 7:00 AM at a park in Evanston, a bit northwest of where the North Shore Century typically starts. Even though I got up early enough to eat my usual breakfast of two eggs, turkey bacon, and coffee, I was running late getting out the door. I barely made it to the starting point in time to get my bike off the rack and get the rundown for the first leg of the ride along with my cue sheet. I had neglected to get cash out the night before to pay my ride fee, so I was going to have to stop at the first ATM that presented itself along the ride. This was to be a source of adventure later in the ride. The first rest stop arrived rather quickly at a park along the way. Typical fare was available such as bagels, bananas, granola bars, and for those folks to who didn't fuel up with a proper breakfast, there was also juice and coffee. Most everyone took advantage of the bathrooms and the water fountains before saddling up to hit the road again. I informed my riding buddy Cesar, that I would need to stop to pick up some cash and thus we'd need to work together to speed back up to catch the group again. Not long after leaving the first rest stop, I saw a gas station and a small strip mall to the left side of the road. I moved out of the pace line and bolted for the station, Cesar in tow. I hoped I could get the cash out and catch up with the group before they got too far ahead. The gas station turned out not to have an ATM but the CVS Pharmacy next door did. Cesar watched the bikes while I dashed in offer my card to the money god. Cash in hand, we hit the road again and promptly realized we were lost. We hadn't been paying attention to the cue sheet and had instead been relying on the ride leaders to take us along, our ignorance of our location increasing with every turn. A quick phone call to the rider organizer resulted in some gentle chastisement about developing the skill of reading a cue sheet followed by being put on speaker phone while the sag driver and rider organizer consulted. We quickly figured out where we were and Cesar and I started out again, hoping at best to catch up to the group at the next rest stop. By this time we were around 10 to 15 minutes behind the rest of the riders. Consulting with the cue sheet, now affixed to the top of my front rack bag, I was able to lead us to the next rest stop. The group of riders had not dialed back their speed any, so I was pleased to learn as we rolled to a stop that the slowest riders had only just arrived as we did. I'd been afraid we'd arrive late and not have any time to rest and refuel. Instead, we were were able to relax, top off our water bottles, and have some snacks before hitting the road again. The rest of the day, I'd continue to consult my cue sheet so that I always knew were we were in case I became separated for any reason. I managed to snap a few pictures from the saddle as Cesar and I paced our way back into the main group before attaining the second rest stop. The ride had to stay on this bike path for a few miles through one of the communities that frowned upon large groups of cyclists riding through their streets. I was okay with this. Paths can be quite nice when available as they're often quiet and can allow you to relax and enjoy some scenery without having to be constantly vigilant about riding with traffic, even on lightly traveled roads. Though narrow, this path was a nice, often shady corridor of green. We could hear birds and chipmunks on either side of us and with long straight sections we could keep a nice brisk pace, occasionally having to drop back to ride single file when other riders approached from the opposite direction. After a lengthy stretch on the path, it was back onto the road. Flanked by trees on both sides that almost met overhead, it was a very pleasant change from the much less green, highly urban environment we usually have to ride in closer to cities like Evanston and Chicago. Leaving the last rest stop before the halfway point and lunch stop, we passed by a large open area to our left which was one of the many prairie restorations being implemented all throughout northern Illinois and through areas of Wisconsin. Rolling into Kenosha, I was riding with a guy named Bob who Cesar and I had ridden with back during our Chicago to Milwaukee century. Bob had planned on making a side trip a mile or so out of the way to the lunch stop, with the intent of acquiring some beer not available in Chicago. The plan was to purchase the beer, carry it to the lunch rest stop, and have the sag wagon carry it for us until the end of the ride. This neat older looking building intrigued me as we stopped to wait for a red light. We detoured off the main route about a mile west and arrived at a neat establishment called Tenuta's Delicatessen-Liquors. If we hadn't been planning on lunching at the velodrome, I'd have been tempted to sample some of the mouth-watering barbeque that was being grilled out on the patio in front of Tenuta's as we pulled in. Inside was a surprisingly huge selection of beers, including New Glarus, a brew from Madison that is not distributed outside of Wisconsin. Many long distance riders who also have a taste for beer make a point of acquiring some New Glarus every time they venture into Wisconsin from the Chicago area. Luscious tasty beer stretched off into the distance. We managed to fill an entire shopping cart between the two of us. There were so many varieties. I wished I could've taken more, but opted instead for a six pack of Dancing Man Wheat, a bottle of Strawberry Rhubarb Wheat, and a mix-and-match six pack of several different varieties including Blacktop, and Dancing Cow. Needless to say, I had plenty of space for beer. In fact I could've bought some more. Had I not already had a sampler 12-pack of Big Sky at home, I might have bought more New Glarus. We arrived at the lunch time rest stop just as everyone else was rolling in. Riding with Bob, Cesar and I made pretty good time, even with our side trip to Tenuta's. We relaxed, each had a bottle of Dancing Man Wheat, dropped off our beer with the sag wagon driver, and enjoyed a leisurely lunch. I partook of a ham sandwich, PB & J, some chips, and of course bananas and oranges. We took the opportunity to refill our water bottles and hopped onto the velodrome for a spin before hitting the road back to Chicago. It's surprisingly difficult to ride the highly banked track, especially on a 35 pound bike loaded with the extra weight of moderately loaded bags and panniers. Here yours truly hammers out a couple spins round the track before declaring it to be too much like work. Sadly, this was to be the end of the road for Cesar. His expensive Cannondale Synapse bike is shod with tubular tires and he received a flat tire. In spite of my previous warnings to Cesar to sell his impractical rims and buy clinchers, he persisted in keeping them and tempted fate by not acquiring any sort of suitable replacement tires to carry on trips like this. Unfortunately, he finished out his ride in the sag wagon with his bike on the rear rack. I rode most of the final 50 miles with this group of folks, many of whom turned out to be fellow riders in the Endomondo National Bicycling Challenge. Views of Lake Michigan as we left Kenosha were picturesque almost beyond words. The waters of the lake were a beautiful greenish blue color almost as if we were biking along an oceanside path. For a while I dropped back with the main group, the fast guys at the front being a bit too much to keep up with. We rode on the shoulder of one section of busy road before heading into quieter country roads and residential roads. At the final rest stop before the conclusion of the ride, we were surprised by some nasty storms that began to brew to the west. Realizing we would be caught out in some heavy rain most of the riders finished filling their water bottles, choked down a couple snacks and bolted south for Evanston and the finish. I ended up starting a couple minutes after everyone else, having dashed into McDonald's a couple minutes earlier to get an ice cream cone. I was torn between finishing my cone and hitting to road. In the end I scarfed as much as I could without giving myself a brain-freeze, threw rest away and hit the road. Minutes later, it became obvious I was going to be getting very wet. With the the rain pouring down, I had resigned myself to a long slow slog for the last 10 miles or so back to Evanston when I heard someone calling my name from the side of the road. Bob, and a few other riders had pulled over to shelter from the worst of the storm under the overhang of a convenience store, appropriately named, "Bob's Pantry." On the advice of one of our companions, Bernie, we chose to take a path called the Green Bay Trail back into Evanston. The Green Bay Trail runs arrow straight as it follows the Metra rail line from north back southwards into Evanston. With the rain coming down, we rode full out on the muddy gravel trail with the trees close in on either side and our blinkies glaring out in the dim light. 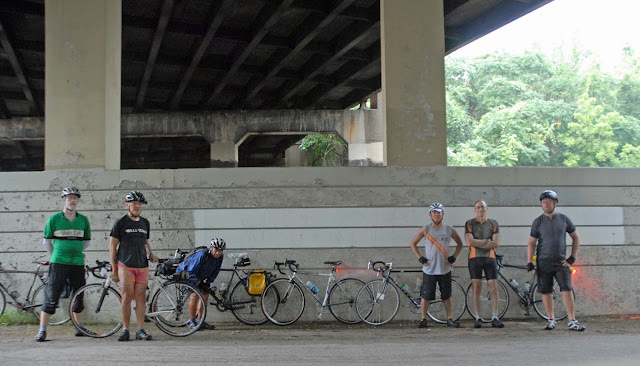 We stopped under an overpass briefly to get some respite from the rain. I experienced a sci-fi nerdgasm when I realized a bit of graffiti on the wall read, "Bad Wolf." Alas, none of my fellow riders were familiar with Christopher Tennant as the 10th Doctor Who along with his lovely companion Rose Tyler played by Billie Piper. The soundtrack for the last leg of our ride into Evanston went from Jimi Hendrix's "Rainy Day," suggested by me, to "I Can See Clearly Now (The Rain is Gone)" by Jimmy Cliff, suggested by fellow rider Yao. We arrived at the starting point for the ride, the first of any of the riders to make it back. About ten minutes later our sag driver returned, and Bob and I collected our booze and we all parted ways with hand shakes, some of us with a lengthy drive back through Chicago to get home while others still faced another ten-plus mile ride to get back to their own homes. All in all, it was another century ride under my belt and the main thing I took away from this ride was that I no longer felt daunted by the thought of riding 100 miles in a day. In fact, I think I've come to enjoy the challenge of riding 100 miles in a day. I'm even considering undertaking the sport of Randonneuring which will have me participating in brevet rides of longer distances. For the time being though, I'll content myself with the North Shore Century which is just under a couple months away. Until then, I'll continue to rack up longer rides of at least 60 miles on my weekends and maybe a self-supported century before then.